My name is Axel Attal and I am a certified personal trainer with the American College of Sports Medicine (ACSM). I strongly believe in merging the gap between science and application; a trainer that cannot apply their knowledge to their craft is just as incompetent as a trainer who has no knowledge. So as you may imagine my experience in the fitness industry ranges from both sides of training: being a personal trainer and an athlete. I also believe in honest, realistic goal setting and working hard towards those goals. I became interested in the human body at an early age and have since been involved in training and teaching individuals as well as learning from people within the industry, be it instructors, educators or other trainers. I spent 2 years at Capilano University in the Human Kinetics program attempting to improve my knowledge while simultaneously volunteering at a physiotherapy clinic (Lynn Valley Physio) in order to further apply the knowledge I procured. My training experience begun at Steve Nash fitness world and has allowed me to deal with a wide array of clientele; I have trained people that had many different goals, some to stay fit and healthy, to recover from an injury or to improve performance in a sport. 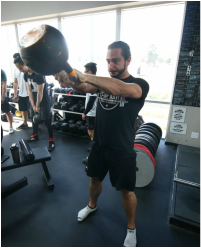 As an athlete, I have been involved in many different sports such as kickboxing, rugby and weightlifting among others and again, this allows me to bridge the gap between science and application. I will be able to push you to your limits while understanding and sympathizing with your goals and needs, because I’ve been there before! And I’m still learning. Hence I continually push myself both physically and mentally, and as I grow my clients grow. Both in physical attunement and mental fortitude. If you want to push yourself to new heights and understand what it means to work hard for the results you earn, then contact me and we can begin working on your goals and strive to achieve nothing but greatness!